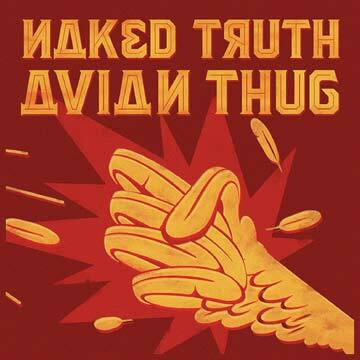 Naked Truth’s 3rd release wears its influences unashamedly on its sleeve. In this case, we’re talking a mix of 70s Miles jazz-rock and 80s synth & bass-driven movie soundtracks, with a seasoning of electronic mechanical harshness. No surprise to find Bill Laswell as co-producer. The opening organ and trumpet ‘fanfare’ sets the tone but from the start there are sinister bass undertones and these, together with the precision punch of Mastelotto’s drumming give the whole affair a constant air of percolating menace. This the sound is often dense but the separation and clarity (both in terms of the roles and the sound production) ensures that however busy the soundscape, each sonic contribution is distinct. The centrepiece is Tense Shaman, one of two longer tracks, which begins with a machine-like rhythm before giving way to painterly abstraction from Haynes with subtle keyboard interjections and sci-fi electronics. The title track begins with a short but gripping drum showcase before plunging into full-on organ-led prog-jazz set against a nicely lurching rhythm. After the previous insistency, the last two pieces ease off a little while retaining an unnerving quality. Day Two at Bedlam offers passages of delicacy after a carefully constructed industrial intro. Moon at Noon begins introspectively (35 years ago it would’ve been a haunting addition to the Blade Runner soundtrack) before maturing into more groove-based territory to see us out. Dense, moody, frenetic, at times demanding, yet retaining a somehow playful edge, there are unplumbed depths here that invite regular listening. The feathered fist on the cover is rather fun too.